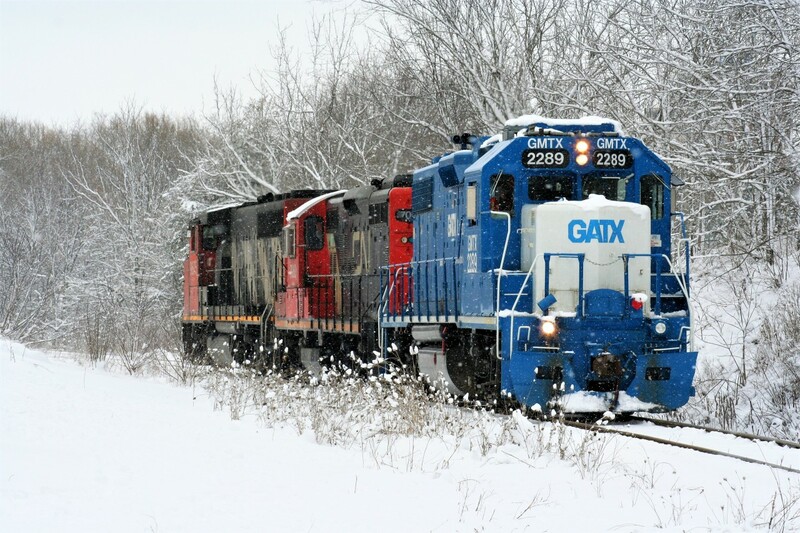 Railpictures.ca - Jason Noe Photo: The calendar might say spring; however CN L568 is rolling through a winter wonderland on the Huron Park Spur in Kitchener as it approaches Victoria Street. The train, powered by GMTX 2289, 7080 and 9675 had set-off cars at the interchange with Canadian Pacific in Kitchener as well as spotted one boxcar at Convoy Supply Limited. After returning on the spur light power to the Guelph Subdivision, the units would head westbound to Stratford. March 31, 2019. | Railpictures.ca – Canadian Railway Photography – photographie ferroviaire Canadienne. Caption: The calendar might say spring; however CN L568 is rolling through a winter wonderland on the Huron Park Spur in Kitchener as it approaches Victoria Street. The train, powered by GMTX 2289, 7080 and 9675 had set-off cars at the interchange with Canadian Pacific in Kitchener as well as spotted one boxcar at Convoy Supply Limited. After returning on the spur light power to the Guelph Subdivision, the units would head westbound to Stratford. March 31, 2019. Thanks Arnold. Yes I agree! Very nice!!! But it is almost April !!! After you left, they set-off their interchange cars for CP then left the interchange with one UP boxcar for Convoy Supply, which they set-off fairly quickly, then light power back up the spur. So within 40 minutes or so I’d say after you left. Great shot Jason! You got it coming back up. That was definitely the best winter scene. How long after I left was this I’m wondering?